Adriatic Piran i Piran, Slovenia: Bestill nå! 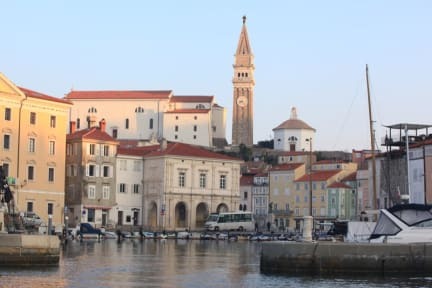 Adriatic Piran is a new small hostel situated in the historic center of Piran. The beach is a 3-minute walk away. Hostel Adriatic Piran situated in central location of the town's pedestrian zone, close to the beach surrounded by restaurants and bars. Main Bus Station is within a 3-minute walk. Tartini square (main square) is a 3-minutes walk away. Airport Portorož - 9 km, Pula- 98 km, Ljubljana -140 km, Venezia 200 km. Adriatic Piran offers compact rooms with free Wi-Fi for 2, 3, 4 or 6 guests. Each guest has a personal locker and individual light. The kitchen, 3 shower tubes and 3 WC's are shared. Guests may use a washing machine and an iron. Check in from 14:00 to 18:00. Cancellation policy: 96 h before arrival. Payment upon arrival by cash, credit cards, debit cards. This property may pre-authorise your credit cards. Taxes not included - occupancy tax 1.27 EUR per person per night.